Dress is casual and colorful. World's largest naval and maritime museum. Tour Charleston's beautiful old historic district and complete your afternoon with a tour of the Citadel's unique campus and an impressive dress parade. After a long day it's back to Clarion's hospitality room for 'show & tell' sea stories, a libation, and maybe a bit of R&R. Dine on your own at the hotel or one of Charleston's fine restaurants or nearby Denny's, Red Lobster, Noisy Oyster and many others. Continue on to Boone Hall Plantation, which was used in the filming of the TV miniseries, "North and South", and for background filming "Gone With the Wind". Transportation to and from Group events. 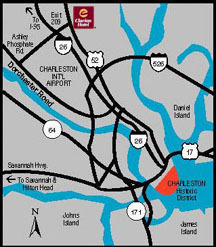 · Six minutes from the Charleston International Airport. From 1-95, take I-26 East to Charleston. From I-26 East, take Exit 209, Ashley Phosphate Road. Once you have exited off you will come to a Stop Sign, take left on to Northside Drive. At the first traffic light, take a left onto Ashley Phosphate Road. Proceed over the overpass until you come to the next traffic light, take a left on to Northwoods Boulevard. Turn left into the 3RD driveway between the Speedy Oil Change and the Fire Stone Service Center. The Clarion is directly behind there. From I-26 West to Columbia, take Exit 209, Ashley Phosphate Road. Once you exit off the interstate,you will come to a traffic light, go straight through the light on to Northwoods Boulevard. Turn left into the 3rd driveway between the Speedy Oil Change and the Fire Stone Service Center The Clarion is directly behind there.